NUWAKOT, Nov 7: Congestion along the road connecting Galchhi of Dhading district to Rasuwagadhi - the gateway to China in Rasuwa district- has been creating hassles for vehicles to ply on it. Though regarded as lifeline for Nepal-China trade, in lack of repair and upgrade this single-lane 102-kilometer road is being considered as a risky route to trade. During Tihar this year, he was forced to bear a loss of Rs 60,000 when the apples he was transporting to Kathmandu rot on the way due a day’s delay. “We take huge risk to do business. If not us, someone else will take over. 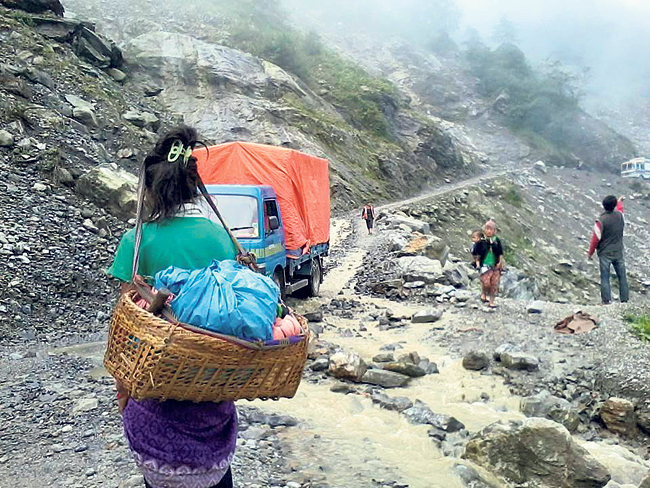 Whoever does it, one should be ready to face the loss unless the road’s condition is improved,” Dharma Lal Shrestha, a trader whose trucks ply along the route, said. The delays are not only because one’s truck gets stuck but also if someone else’s truck gets stuck, he said. “This is a single lane road. So, if a single vehicle gets stuck, vehicles on the both side get stuck.” Reflecting on his experience, he claims that there is rarely a day when there is no traffic-jam along the road. 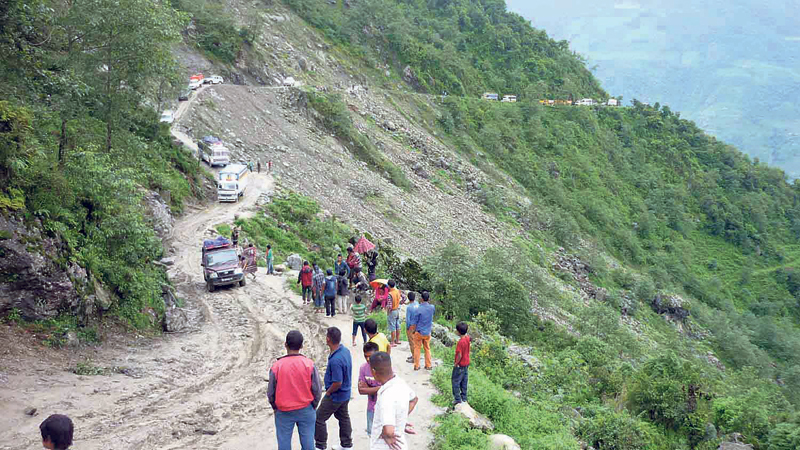 Only 24-kilometer section of the road from Galchhi to Bidur of Nuwakot is black topped. But it is also not broad enough to allow two vehicles to pass. Babulal Tamang, a local leader, accused the government of neglecting the route, despite its importance in boosting trade with China. Most of the route is part of the Pasang Lhamu Highway. “Both traders and locals have been tired of this. This narrow road that is full of landslides has been making it hard for us to earn a living. But, it remains unknown as to when the government will respond to our woes,” he said. Along with the road, lack of parking area at the Rasuwagadhi border area is another problem that the drivers have to cope with. “There is no parking zone at the border point for us to load and unload our trucks,” Thapa shared. This 190 kilometer route from Kathmandu to Kerung has been on both governments’ priority list but locals and stakeholders feel that least has been done to actualize the status accorded to it in diplomatic dealings. A woman waits for a ride as a lorry loaded with goods negotiates a muddy slope along the Pasang Lhamu Highway in this recent picture.